The oldest pagan grave in Istanbul has been discovered during the restoration of a historical mosque in Zeyrek neighborhood in Fatih district, reports said Wednesday. The 1,700-year-old grave was reportedly discovered while restoration teams were working at the Şeyh Süleyman Mosque. The grave was found at the ground floor of the mosque and was confirmed by Italian experts and officials from the Directorate General of Foundations. The restoration was part of a project including archaeological excavations, seismological tests and scans near the mosque's site and also unveiled various graffiti from the Ottoman period. Archaeologist Murat Sav told the HaberTürk daily that the grave was constructed in the late Roman era. "There are two more floors under the mosque from the Roman era," Sav said, adding that the underground floor consists of an eight-section burial chamber, referred to as arcosolium. He noted that in one of the sections they discovered a piece of altar used to offer sacrifices, which was looted during the Byzantine period. 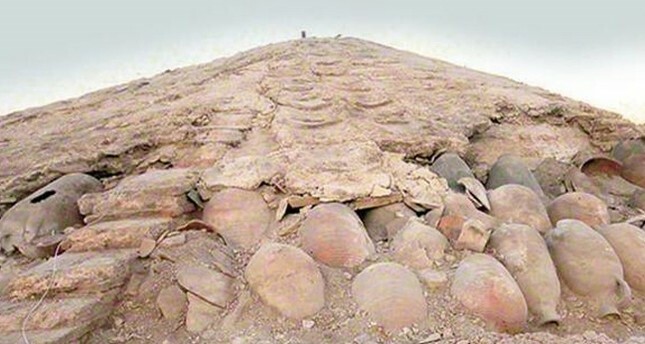 Sav also said that they found Byzantine-era amphorae at the roof of the mosque and have put them under protection. The structure of Şeyh Süleyman Mosque was built 1,700 years ago as a grave site and was turned into a dervish lodge by Şeyh Süleyman Efendi. It was significantly damaged in a fire in the 18th century. Paganism persisted in Istanbul until Christianity's prevalence in the seventh century.